The Special set contains 8 high-quality RAU Cosmetics skin care products: Face masks, ampoules, day cream, eye gel and peeling! Fleece mask with hyaluronic acid, aloe vera, collagen and camomile extract. With just one application, the face is intensely moisturized and wrinkles are visibly reduced. Hyaluronic Acid cream for dry skin with active substances such as shea butter, avocado oil and squalane (extracted from the olive). Used regularly, there is a moisture-promoting effect and the skin is better moisturized and feels firmer and more youthful. Detox: 2-phase serum for skin detoxification. Moist: The skin is supplied with moisture and looks plumper. Vitamin A: Stimulates cell renewal and is effective against premature skin aging. Gentle eye cream with white tea & seaweed extract, which moisturizes the sensitive skin around the eyes. Face mask with aloe vera, arnica, brown algae, Ginkgo & cypress extract which stimulates blood circulation and reduces inflammation. 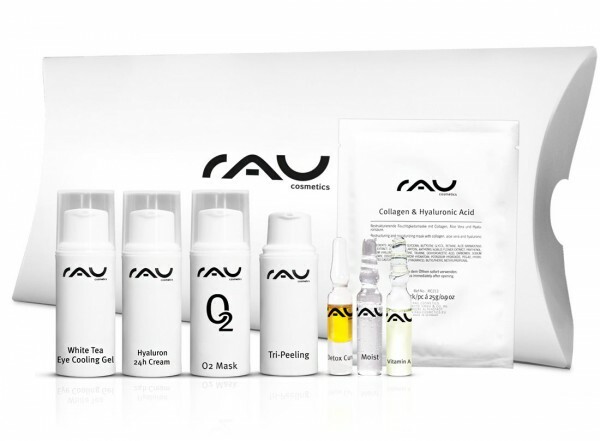 Related links to "RAU Cosmetics Gift-Set Special"
Customer evaluation for "RAU Cosmetics Gift-Set Special"
RAU Collagen & Hyaluronic Acid Fleece Mask 10 Pc.